The college is at 6000 16th SW on Puget Ridge. Alice also shared this info-sheet about the eclipse. Short version: Total eclipse starts at 8:41 pm. Updates to come! 8:20 PM: Haven’t looked yet? It’s very cool right now. About 2/3 covered. 9:04 PM: The moon is still covered, but duskily visible, if you haven’t looked yet! 9:29 PM: Note that the total eclipse, according to the timeline Alice shared, ends at 9:43. 10:58 PM: Though the eclipse may look over, it’s not fully over – the penumbral phase doesn’t end unti 11:48 pm. Right about the time of today’s winter-solstice moment – just before 2:30 pm – the sun emerged to greet the newly arrived season. And it hung around long enough for squinting and sunglasses to be in order at NASA volunteer Solar System Ambassador Alice Enevoldsen‘s sunset-watch event at West Seattle’s Solstice Park. The park has paths and markers that align with solstice/equinox sunsets, and the dozens in attendance were able to fully appreciate them today. Sunset watch also means a lesson about the Earth, the Sun, and how the solar system works. Now that the days are going to start getting longer – just a tiny bit at first, Alice noted when asked, so don’t get too excited yet – you can start looking forward to the spring equinox, just before 3 pm on Wednesday, March 20th, so plan on sunset watch with Alice a few hours later. The weather should be a lot calmer on Friday afternoon, when winter officially arrives – the solstice “moment” is at 2:23 pm. An hour and a half later, you are invited to the change-of-seasons sunset watch with Alice Enevoldsen at West Seattle’s Solstice Park (7400 Fauntleroy Way SW, upslope from the tennis courts). Be there at 3:45 pm to mark the change of seasons (and to learn about it too). It’s a West Seattle tradition for the changing of seasons – an equinox or solstice sunset watch at Solstice Park with Alice Enevoldsen. Even if she’s going to be out of town on the actual equinox or solstice date, which is why she was there tonight to educate a small but hardy group. And yes, there was some sunset color! Explaining the relationship between earth and sun at the seasonal change is one of the things you learn at Alice’s events. So if you couldn’t be there tonight, stand by for the winter-solstice edition, just three months away! Though the summer solstice isn’t until Thursday, Solstice Park still provided a sunset show when NASA Solar System Ambassador Alice Enevoldsen held her quarterly gathering a few days early. Summer officially arrives at 3:07 am Thursday (June 21st). Alice had to bump up her quarterly viewing because of a scheduling conflict this time, but watch for word of her next sunset event greeting the arrival of fall! If you’re looking forward to marking the change of seasons with Alice Enevoldsen‘s quarterly sunset watch at West Seattle’s Solstice Park – you need to know it’s happening a few days early this time around! Because of a schedule conflict, Alice will be at the park 8:30-9:30 pm this Saturday, June 16th – should be a great way to end a warm, clear day. (This year’s actual solstice moment will be 3:07 am Thursday, June 21st.) All ages welcome and encouraged; if you’ve never been to one of Alice’s sunset watches, it’s informative, fun, low-key, drop-in/drop-out when you want. Solstice Park is upslope of the tennis courts across from the north end of Lincoln Park (7400 Fauntleroy Way SW). 10:20 PM: We were just looking out at the almost-full moon and wondering about the “star” visible west of it; the WSB inbox has yielded an answer, and then some. Trileigh Tucker e-mailed to say that’s Jupiter and “it’s clear enough that you can see several of Jupiter’s moons!” You can try looking with a telescope or binoculars. Trileigh explains, “Jupiter’s very bright, to the slightly upper right of the moon. Jupiter’s moons are the tiny white specks lined up on a tilted angle to Jupiter, pointing upper right.” Scientists believe Jupiter has more than 60 of them! ADDED 11:27 PM: Thanks to Greg Snyder for the Jupiter photo! Not to rush through spring, but … if you feel like setting your calendar for Alice’s next sunset-watch event, it’ll mark the first sunset after the summer solstice, on Thursday, June 21st, 8:45 pm-9:45 pm. Alice has been leading sunset watches for nine years now! That was the spectacular sunset on March 20, 2014, as seen from West Seattle’s Solstice Park, during NASA Solar System Ambassador Alice Enevoldsen‘s spring-equinox event. Our archived coverage shows that was the most-recent time the sun cooperated with Alice’s spring sunset watches – but the forecast for the next one, 6:30-7:30 pm Tuesday (March 20th), looks promising! 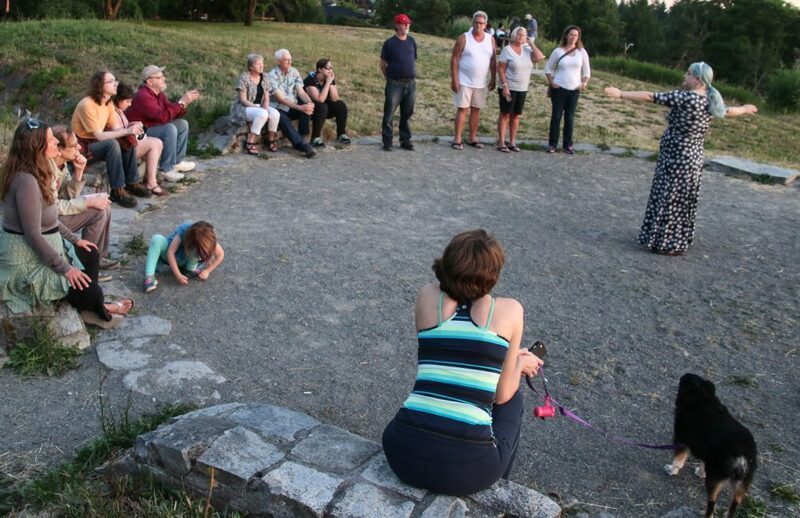 You’re invited to join Alice for the free and fun informational all-ages gathering Tuesday night – here’s how to get to Solstice Park (7400 Fauntleroy Way SW, uphill from the tennis courts) if you haven’t been there before. P.S. Spring officially arrives at 9:15 am our time Tuesday. While the official sunset time will be around 7:20 pm, Alice has noted over the years that the moment of disappearance behind the Olympic Mountains is usually about 10 minutes earlier. She always schedules them for the same date the equinox or solstice arrives in our time zone, so it’s easy to remember – that means you can plan to join her at Solstice Park for the arrival of spring on Tuesday, March 20th, 2018. Watch her website alicesastroinfo.com for more info on that and other things you might see in the sky. I saw it. At 7:37 I was heading WB on the bridge and super bright glowing green thing fell from sky to the NW then flamed out. I was rowing on Lake Washington and saw it above UW stadium. It was green and burnt out in about 4 seconds. It was amazing. We are in the throes of the Orionid meteor shower. It peaked this past weekend but it lasts a couple more weeks. Here’s more on the Orionids. Clouds prevented a clear view, but it was a pretty sunset just the same. Alice also folds in the most-recent skywatching highlights – so this time, that meant some talk about last month’s eclipse, and the recent end of contact with Cassini. It’s time for the 34th seasonal sunset watch! We’ll also share eclipse stories and favorite moments or pictures from Cassini (RIP, now part of Saturn). If you drew a picture of the eclipse, either before or after, I would absolutely love to see it. Actual sunset is supposed to be at 7:06 pm, but we have noticed that the Sun sets about 10 minutes earlier than the USNO says, because of the horizon altitude. The equinox moment is Friday, September 22 at 1:02 pm. I’ll be there even if it is cloudy because sometimes the Sun peeks through just as it begins to set, but if it is driving rain or a thunderstorm I’m staying home with some tea! Moonset on Friday, by the way, is 8:40 pm, and Alice notes that it’ll be a waxing crescent with seven percent of its disk illuminated. P.S. If you don’t know where to find Solstice Park – Alice explains on her website. If you haven’t finalized where you’re watching tomorrow morning’s solar eclipse, here’s a list of nearby gatherings – some of which you might already have found in the WSB West Seattle Event Calendar. First – as expert skywatcher Alice Enevoldsen has warned (among many others) – DON’T LOOK AT THE SUN WITHOUT SPECIAL EQUIPMENT! If you didn’t already get viewing glasses (the comment section on our original report from last weekend morphed into a marketplace of sorts), some viewing parties will have glasses – sharing might be required. Solar Eclipse viewing party at Junction Plaza Park. On the event that could be the largest scientific viewing in human history, the total solar eclipse will occur at 10:20 am. During a total solar eclipse, the Sun is entirely blocked by the Moon, and in totality, night appears in the middle of the day. While Seattle is not on the path of totality we will experience a partial eclipse with over 92% of the Sun blocked, still an event to behold. BYOSG (bring your own solar glasses). We’ll have refreshments and snacks. ALL ROUTES: Between approximately 9:05 and 11:40 a.m. on Monday, August 21, the moon will block a portion of the sun — with a peak of 92-percent coverage at 10:20 a.m. Some of the best views of this solar eclipse will be aboard a Washington State Ferry. However, all passengers are advised to take precautions before viewing the eclipse, as looking directly at the sun is extremely harmful to your eyes. Seattle’s Pacific Science Center advises everyone to view the eclipse with an approved special solar filter, such as glasses or a pinhole projector. Please protect yourself, and we hope you enjoy this rare event. Nearest route to our area is Fauntleroy-Vashon-Southworth – the schedule is here. If you walk on, keep in mind that you do have to disembark at Southworth, even if you are walking right back on to finish the round trip. Anything in the area that we’ve missed? Please comment, or e-mail us (editor@westseattleblog.com) so we can add! EDITOR’S NOTE: With one week until the solar eclipse, West Seattle’s best-known sky-watcher is continuing to offer helpful info – in this report, the basics about the eclipse and safely watching it. Still to come, a list of where to eclipse-watch in West Seattle! Are you ready for the big solar eclipse that’s now one week away, on August 21? Special Equipment Needed? Yes: safe observing glasses or a pinhole viewer. (Here’s where to look and, in the comment section, where WSB readers are finding them.) Read on! EDITOR’S NOTE: With nine days until the solar eclipse, we’re getting questions about where to get viewing glasses, and West Seattle’s best-known sky-watcher has put together a list. Watch for more pre-eclipse coverage here tomorrow and beyond, too. I will tell you where you can get safe eclipse glasses after two short paragraphs of safety information; my conscience won’t let me skip the safety warnings. You absolutely need special equipment to see this event safely. Eclipse glasses are also called solar-observing glasses and they are not related to sunglasses. There are only a handful of companies that make glasses that meet the current international standard of safety. *Check that the lenses are flat and free from scratches, punctures, or damage. Discard them if there are problems. *Stand still, looking away from the Sun. *If the Sun looks bright, or your eyes get tired from the glare, then the filter is letting too much light though. Look away and use a different filter. I’ve included some farther than West Seattle because everywhere has limited supplies. Most of these locations have the glasses behind the main counter. Seattle Public Library Branches — FREE! All the branches of the Seattle Public Library are participating in the Space Science Institute’s STAR_Net Initiative with support from NASA, Google, and the Gordon and Betty Moore Foundation. You can pick up one pair per family while supplies last. ORIGINAL REPORT, 10:08 PM SATURDAY: Getting multiple messages about a sight in the sky over West Seattle in the past 15 minutes or so – Jill described it as “an awesome meteor traveling northward, looking east from Admiral/Belvidere.” Anyone else? 10:15 PM: Checking Twitter – still the best place to check real-time reports – we see reports from all over the Northwest – Astoria, OR, to Victoria, B.C., among others. 10:48 PM: Our local sky specialist Alice Enevoldsen points us to the American Meteor Society website, where you can report sightings, and that site in turn reminds us we’re just 2 weeks from the Perseid shower’s peak. 11:05 AM SUNDAY: We don’t know yet if the time frame matches, but the government announced this morning that it conducted a missile-defense test in Alaska overnight – here’s one of the reports, and here’s the government news release. Worth noting that one of the Missile Defense Agency‘s radar vessels, SS Pacific Tracker, was in West Seattle recently; the day it left (July 21st), MarineTraffic.com last showed it headed north, off the west coast of Vancouver Island. The test was preceded by an alert, according to this report that includes video of a test earlier this month. Still haven’t seen any word on exactly when the test happened. During her 33rd quarterly seasonal sunset watch, Alice was mostly looking ahead to the rare sight that’s now exactly two months away – the August 21st solar eclipse that will be visible in totality as close as parts of Oregon. Those who joined her at the park of course also got the chance to learn about and commemorate the changing of the seasons – this year, the solstice moment was less than half an hour after sunset, which was mostly obscured by clouds, aside from the show of pink in the photos atop our story. So, back to the eclipse: While it won’t be total up here, you’ll still see it at about 90 percent, Alice pointed out. The most important thing is HOW you view it, so you don’t damage your eyes. You can create pinhole viewers or else get a special type of eyewear – cardboard glasses like the ones she showed are on sale at the South Seattle College (WSB sponsor) library – they look cheap, she acknowledged, but they get the job done. The most important thing in eclipse eyewear, she said, is to adhere to ISO 12312-2 – explained on this NASA webpage that’s all about safe eclipse viewing. For general eclipse info, she recommends MrEclipse.com. P.S. Alice won’t be in West Seattle to lead an eclipse-viewing party but she’ll be talking with local skywatchers and will let us know if anyone else plans to.